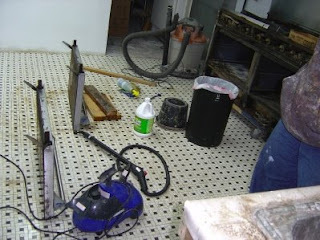 In case you ever wondered why it takes us so long to get Gunk Haus open, well, hello, it's a *bleeping* lot of work, and it's just the two of us, and we do it all ourselves!!! Of course that's only half the story. Both E! and I have the tendency to get very interested in things, almost to the point of obsession. My latest obsession, and I am already infecting E! 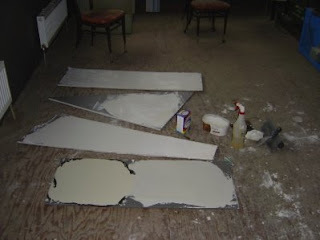 as well, is plastering (that is interior plastering, as opposed to exterior plastering, which is called stuccoing; now don't get all snobby and say that you knew that already, because you have not spent any time reading about it: everybody calls it differently, and there are a gazillion different opinions of what plastering is). In addition, both E! and I are very much into hand-crafting, do-it-yourselfing (eventually, I could totally see us raise the pork, that will end up as schnitzel on your plate - although, schnitzel is better made from veal, I am just giving you an example, gosh, why are you guys so difficult, work with me). Anyhow, so since a few days I have been playing (off and on) with plaster, trying different mixtures (from scratch), and ingredients (we just read about adding linseed oil, how exciting, I will be sure to try that tomorrow), trying to find ingredients mentioned by someone (I don't even know, but sounded credible), and of course wasting a lot of time. Here are a few of my samples (not that there is anything to be seen, but you guys like pictures, so look at it and love it, or I'll post no more pictures at all). So why the sudden interest (obsession) in plastering? Well, we are closing in on the day, where we need to cover the walls somehow. We always wanted to plaster them, but paying professionals is darn expensive (if you think it isn't and you have a lot of money burning holes in your pockets, drop me a note). But I love my wife, and I know she'd really love the plaster, as opposed to simply painting the walls. And that's when I go the extra mile. Meanwhile I found, plastering isn't actually that difficult, and it recently occurred to me that plastering will actually take less time and money than painting. Alright, I already see a few of you dozing off, so enough for today.